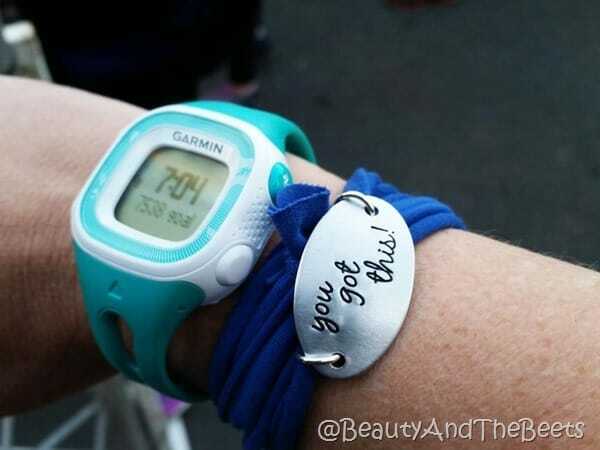 First of all, let’s talk about race prep. The day before the Rock’n’Roll Raleigh Half Marathon I found myself standing in the original Rise Biscuits Donuts location eating….well…. biscuits and donuts. 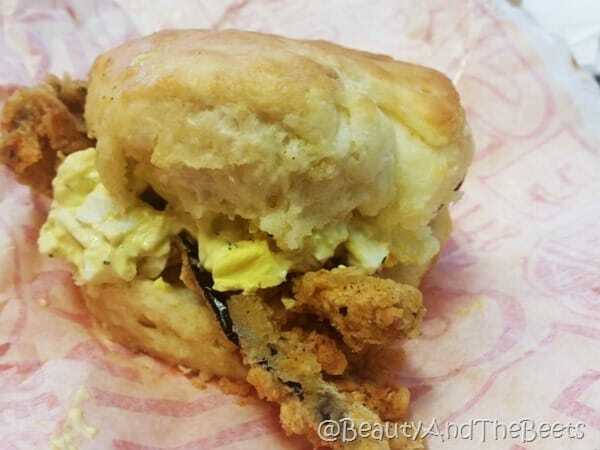 An egg salad biscuit with eggplant bacon. And a Donnoli. 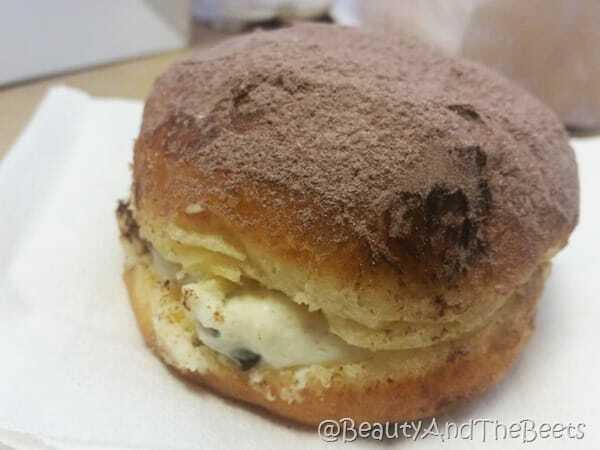 The love child of a donut and a cannoli. Later, Mr. Beet and I met up with some of my #RocknBlog teammates at Cafe Carolina and Bakery. 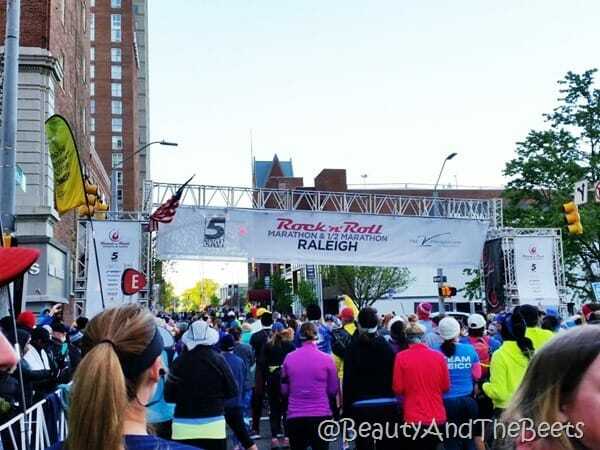 #RocknBlog is an amazing group of runners chosen to run and blog about the Rock’n’Roll Marathon Series and we are of all abilities, stages in running and motivation levels. 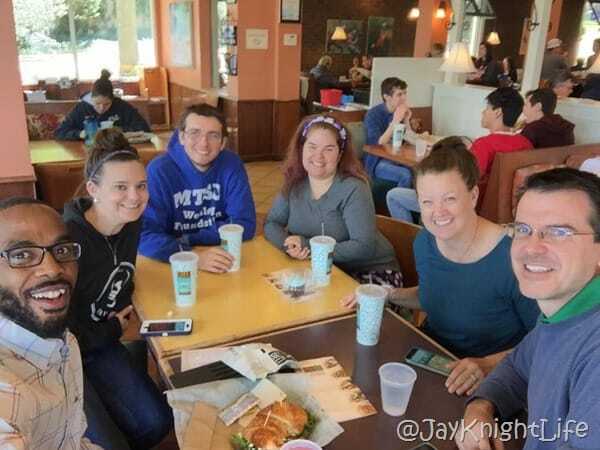 It’s meetups like these that really make all the traveling for races worth while as we all talk online a lot before the race, and now we get to all meet in person. 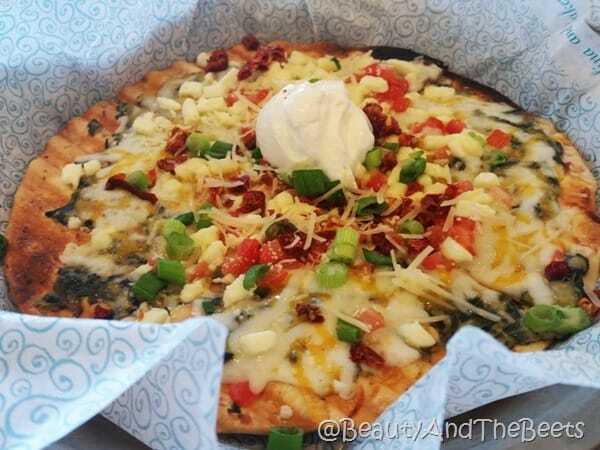 So anyhow, a spinach and artichoke flatbread was my pre-race dinner. Then came race morning. I don’t know what it is lately with me and half marathons. In NYC, we were expecting cold and freezing cold temperatures. In Savannah there was threat for thunderstorms and heavy rain. 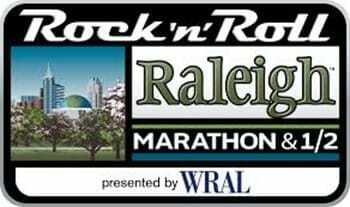 And now here I am in Raleigh, once again expecting uncomfortably cold temperatures at the start of the race. 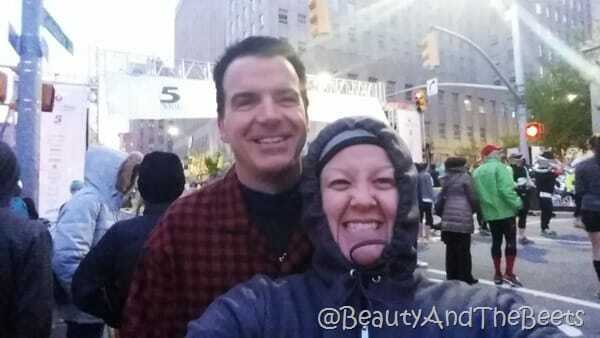 So cold in fact, that Mr. Beet and I made a trip to Target, combing through the sales racks looking for cold weather clothes to bundle ourselves up in on race morning. 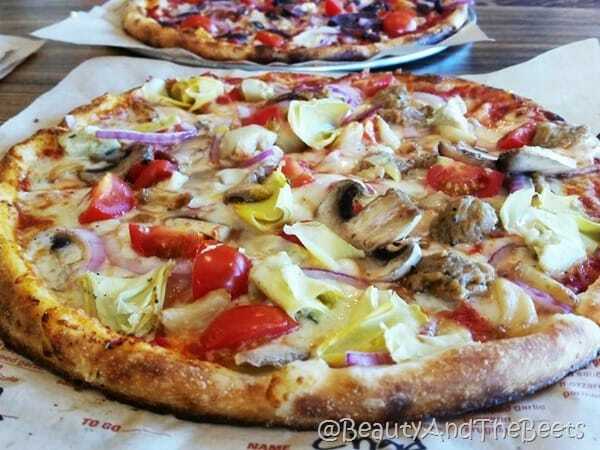 Mr. Beet takes the cake. 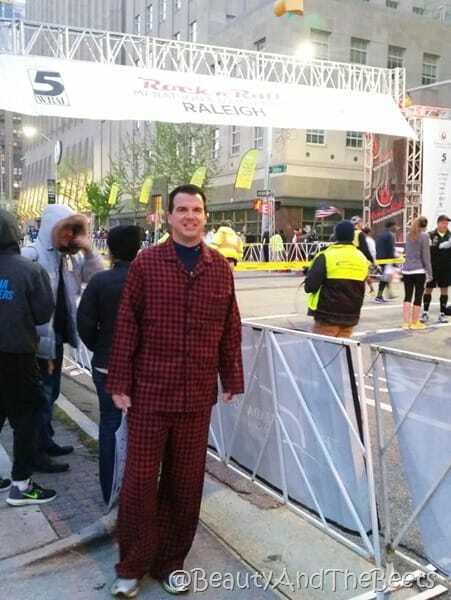 He found these flannel pajamas for $5, and this is how he showed up to the race. People loved his “I just woke up and decided to run a marathon today” look. Seriously, it was cold. 34°. I don’t think that either one of us shed our throwaway clothes until 6 miles into the race. The race itself was hilly. 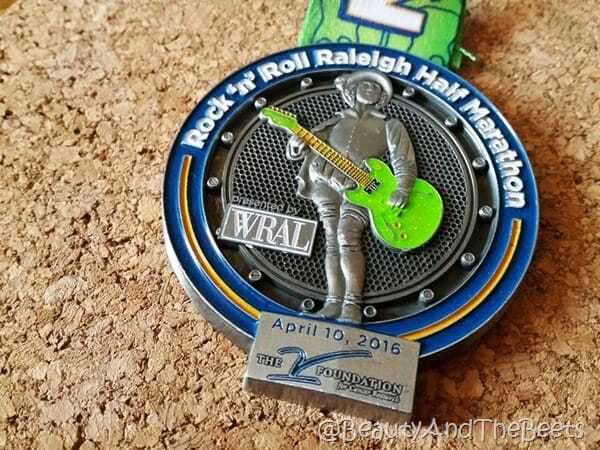 One of our #RocknBlog teammates is from Raleigh and he was gesturing in an almost straight up and down motion when describing the hills. He had me scared. And he wasn’t exaggerating. Raleigh is a very hilly course. And just when you thought that the hills were over, runners are hit with another big hill just before mile 12. Aaaaaggggghhhhhhh! The up and downs (the Raleigh-coaster I have named it) was very painful on my foot. I have dubbed it my bad foot. It seems to never bother me on shorter runs but it gets pretty sore after 13 miles. And especially 13 miles with hills. 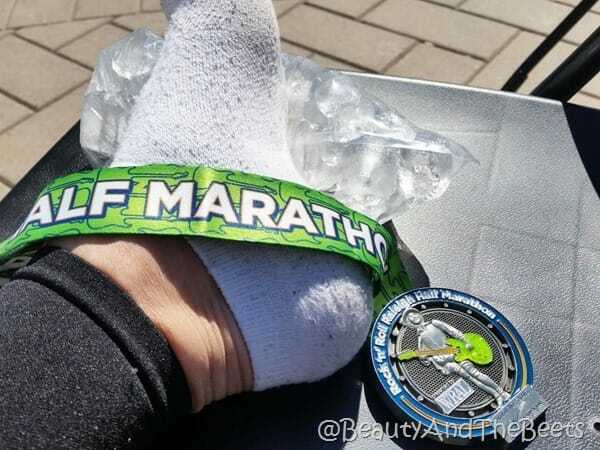 After feeling two distinct cracks in my foot towards the end of the race, I retreated to the medical tent immediately after crossing the finish line. I grabbed a bag of ice, found a chair and iced the foot. Ugh. All in all, I am very pleased with my race time. Even with the hills I managed to record my second fastest time for a half marathon. However, I’m not sure I could take that hilly challenge again, well…I may see you next year Raleigh!! Love the flannel pajamas! That Donnoli look great. Hope you got the foot checked out & it’s ok.